This theater room is 28' long by 15' wide. It has 6 large theater loungers with cup holders. The front seats sat on the floor and the back row sat on a riser. 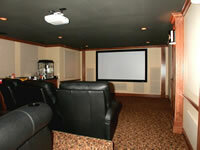 We used a 106" diag HDTV screen and a Infocus 7200 HDTV projector. The audio system is set up for 5.1 surround sound. The front speakers and subwoofer each had an enclosure and were built into the wall. The rear speakers were mounted to the side walls of the room. The electronics were located in the back of the room inside a closet. We used a universal remote control to control all of the equipment.